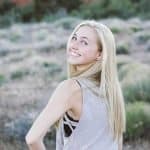 Izabela Comer is a high school student at Desert Hills who is also working on her Associates Degree with the Success Academy Program at Dixie State University. She is working towards a degree in the health field. She is an advocate for eating whole foods and practicing a healthy lifestyle. She enjoys going on hikes, dancing, kickboxing, doing meditations, and hitting the gym with her mom. All activities she uses to bring peace to her world, so that she can be an influence of peace in the lives of others. She is constantly encouraging herself and others around her to accept themselves for who they are, while they are striving to become better. Izabela Shares: I enjoy accomplishing something difficult that requires me to step outside of my comfort zone. Only when brave enough to venture into the unknown can we learn and grow. How else are you supposed to make new friends if all strangers are assumed danger? How can we learn if failure doesn’t come first? I love my failures because they become my biggest successes. It’s the attitude I’m trying to adapt when addressing my failures. I try to celebrate all little things because if not, what is there to celebrate? The little things, lead to bigger successes so why not celebrate every milestone and take pride in everything already accomplished? Debara Bruhn Towt, shares her musical sojourn into healing. Debara affirms “Each person has a song with a melody with unique sounds and words. It is not a song like any one else; it is a profound tapestry woven through the universe. I love to listen to the songs that come forth from each soul, for I am the always blessed & transformed by the grace that attends us. Yes, we are all connected”. Debara shares her experiences in life as a mother, who has lost her father to down wind radio active fallout in southern Utah, lost her brother to HIV related immune disorders, lost her second daughter to a rare birth defect that put her into an eight year coma, lost her oldest daughter to a single car roll over accident.